Who invented the Camera? The name of the person most often credited with inventing the Camera is George Eastman (1854 - 1932) who invented the roll film camera in 1888. George Eastman is not only famous as the American inventor of the Camera but also as a businessman and entrepreneur. Who invented the Camera? George Eastman: George Eastman founded the Eastman Dry Plate and Film Company, later known as the Eastman Kodak Company, and invented the Kodak camera and the first Brownie snapshot camera. His invention of roll films and the mass produced Kodak camera and the Brownie simplified the art of taking photographs making Photography accessible to everyone. Definition of the Camera: The Camera is defined as a portable optical device containing a photosensitive surface that records photographic images through a lens. The basic parts of a camera consists of a casing (a lightproof box), a lens, a viewfinder to frame the scene, and a shutter to control the amount of light reaching the light-sensitive surface, and a focusing mechanism. Fact 1: Who invented the Camera? The Camera was invented by George Eastman in 1888 during the Second US Industrial Revolution era of inventions (1850 - 1914) which was a significant addition to advancements made in the area of Science and Technology. Fact 2: Before the Camera? Prior to the invention of the Camera in 1888, there was no way to instantly capture a moment in time or preserve images. Fact 3: Who invented the Camera? Crucial Innovations: Many different inventors played a significant role in the development of photography and the camera that led to the invention of George Eastman's roll film and the Kodak camera in 1888. Critical innovations included the development of the camera obscura (1827), the properties of silver nitrate (1727), the invention of the Daguerreotype (1837), the Calotype or talbotype photographic process (1841), the Wet-collodion photographic technique (1851) and the gelatin silver or Dry plate process (1871). For facts and info refer to Photography. Fact 4: Who invented the Camera? Dry plate process (1871): In 1871 the English physician Richard Leach Maddox (1816 – 1902) invented an improved type of photographic plate called the Dry plate process. In the Dry plate process warmed glass plates were coated with an emulsion of gelatine and silver nitrate and allowed to dry. Fact 5: Who invented the Camera? 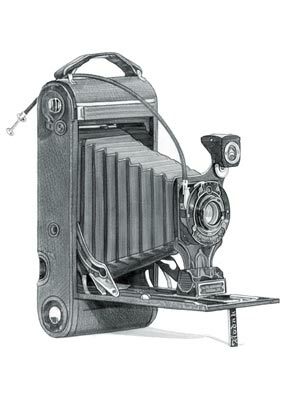 The Dry plate process led to the invention of the roll film camera by George Eastman in 1888. Fact 6: Who invented the Camera? The inventor of the roll film and the Kodak Camera, George Eastman, was born on July 12, 1854 in Waterville, New York, United States and died on March 14, 1932. Fact 7: Who invented the Camera? The early years of George Eastman were spent in Waterville, New York, United States where he was raised by his family on a large farm owned by his parents, George Washington Eastman and Maria (Kilbourn) Eastman. George Eastman had two older sisters, Ellen Maria and Katie Eastman. He was educated at Eastman Commercial College (Business School run by his father) in Rochester. Fact 8: Who invented the Camera? Following his education his first job was as an office boy in an insurance company and in 1877, became a book keeper at Rochester Saving Bank. Fact 9: Who invented the Camera? When George Eastman was 24, he planned to visit Santo Domingo in the Dominican Republic and purchased heavy, and expensive photography equipment so he could take pictures of his trip. However, the trip failed to materialize and George Eastman became determined to improve the wet and dry plate technology used in photography and create a smaller and less expensive camera. Fact 10: Who invented the Camera? The cameras of the time were as big as an ice box and needed a heavy tripod. The equipment required to take photographs included glass tanks, various chemicals and a heavy plate holder. In 1879 George Eastman patented a coating machine and an improved method of coating glass plate with gelatin and silver bromide. Fact 21: Who invented the Camera? On January 1, 1881, George Eastman and businessman Henry A. Strong formed a company called the Eastman Dry Plate Company. Fact 11: Who invented the Camera? George Eastman experimented with replacing the glass plate with paper and then replaced the paper with transparent film. The film was then rolled on spools. These inventions were patented in 1884. Fact 12: Who invented the Camera? In the same year George Eastman teamed up with William Hall Walker, a technical expert who had also experimented with cameras and with producing negatives and prints. Fact 13: Who invented the Camera? George Eastman with William Hall Walker invented a light weight roll holder that would fit into any camera which patented in 1886, US Patent 317049. The film holder assembly was encased in a mahogany box back that replaced the dry plate holder. Fact 14: Who invented the Camera? George Eastman went on to invent his first camera, the Kodak, which was sold in 1888 and consisted of a box camera with 100 exposures. Fact 15: Who invented the Camera? George Eastman chose the name Kodak along with his mother whilst playing with an anagram set. The name 'Kodak' emerged after trying out a number of combinations of letters that made words starting and ending with 'K. The brand name Kodak was short, unique and memorable. Fact 16: Who invented the Camera? In 1889 Eastman developed his new, flexible, photographic film, that he began to sell with the Kodak camera. The new celluloid film was the basis for the invention of motion picture film and the emergence of the motion picture industry. Fact 17: Who invented the Camera? In 1892 Eastman changed the name of his company to the Eastman Kodak Company. Fact 18: Who invented the Camera? George Eastman continued to create new inventions. The Eastman Kodak Company introduced the pocket Kodak in 1897, the folding Kodak in 1898 and the Brownie camera in 1900, which was only $1 and originally designed for children. Fact 19: Who invented the Camera? The outbreak of WW1 (1914 - 1918) led George Eastman to invent special cameras for taking pictures from airplanes. He also developed unbreakable glass lenses for gas masks. By 1920, there were 15,000 people working in the Eastman Kodak factories. Fact 20: Who invented the Camera? In 1907 the French brothers Louis and Auguste Lumiere had invented an additive color process they called "Autochrome". George Eastman started experimenting with color film he called the Kodachrome process. It took years to develop and only succeeded in 1935, two years after the death of George Eastman. In 1950 the company produced Eastmancolor, one of the first widely successful "single-strip colour" processes, that eventually displaced the more cumbersome Technicolor. Fact 21: Who invented the Camera? George Eastman's health failed in his later years as he suffered from degenerative condition that involved a hardening of the cells in the lower spinal cord. George Eastman took his own life on March 14, 1932. Fact 22: Who invented the Camera? George Eastman will always be remembered as the American inventor of roll film and the Kodak and Brownie camera that enabled ordinary people to enjoy photography as their hobby.